Based on Richard Jordison’s “Siege” game that he published in 1974 (there are no Tolkien based concepts in that game but the rules are very similar), this depicts very well the attack of the forces of Saruman against the outnumbered forces of Rohan at Helm’s Deep. This is the first Tolkien hex based wargame, which were very popular in the ‘70s, so this is purely a strategy game. There are no elements of magic (or the Ring since it was never there) other than the fire blasts (depicted by picture of a fuse lit time bomb). The game came in a ‘70s version ziplock bag (not a very good ziplock design back then, harder to close). The game play is well balanced and I have been able to win, and lose, playing both sides. It is probably easier to win as the Saruman player due to the number of units available. The Rohan player has to play a good defensive strategy by knowing when to retreat and hold the strong points. The game is won or lost by Victory Points (minor victory or decisive victory for either side). For instance the Saruman player gets points per turn he has units in the caves or if he is able to “eliminate” Theodin. 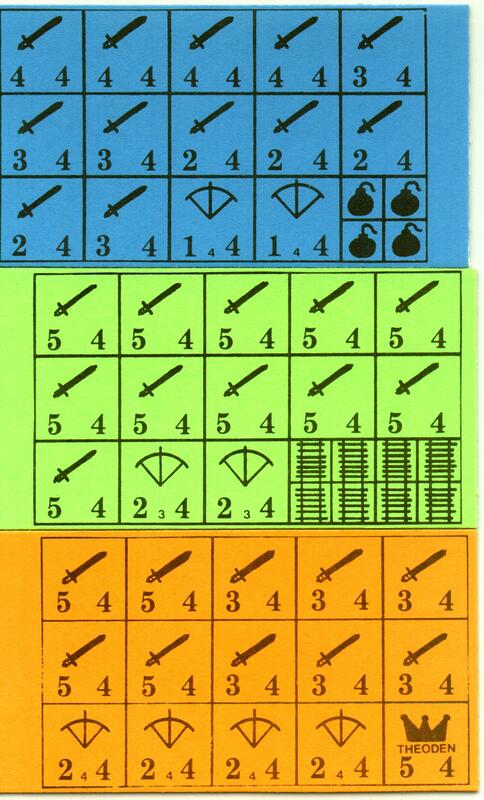 The Saruman player must achieve his victory before the coming of dawn on the fourth day (14 turns) when the game ends. It is assumed that if Saruman didn’t reach the caves then the Forest would have wiped out the attacking army (read the book – this was not portrayed properly in the movie version). A decisive victor is for greater than 100 points, a tactical victory for 75 to 100 points, a tie between 45 and 75, a tactical victory for Theodin for points between 15 and 45, and a decisive victory for points 10 or less. There is a section on Play Balance in case one of the players is a stronger player (for either side).